It may only be February, but it’s already heating up outside in Orlando. Is there a better way to combat the rising temps than with a refreshing scoop of ice cream? We don’t think so, which is why we’ve compiled this list of eight of the finest ice cream shops in Orlando, FL. Read up, then go satisfy that sweet tooth! Okay, so maybe nothing can beat Disney World as Orlando’s top attraction. But Aloha Isle at Magic Kingdom at least lets you enjoy both at the same time. Park-goers flock to Aloha Isle in droves to enjoy its famous Dole Whip®, a refreshing sweet treat available in pineapple, vanilla, or a swirl of the two flavors. Mix it up with an ice cream float or try it on top of a pineapple upside down cake – there’s no wrong way to enjoy this frozen dessert. Tucked away in The Wizarding World of Harry Potter at Universal Studios Florida, Florean Fortescue’s Ice Cream Parlour lets visitors explore a world of interesting and unusual ice cream flavors plucked straight from the Harry Potter films and books. Chocolate Chili, Granny Smith, and Sticky Toffee Pudding make up the menu, but none compare to the shop’s defining offering: Butterbeer™ soft-serve. Whether you’re a Harry Potter fanatic or not, there’s no denying the delectable delights on display at this ice cream shop. Everyone knows Ghirardelli for its decadent chocolates, but this specialty shop proves the chocolatier knows a thing or two about creating heavenly sundaes. 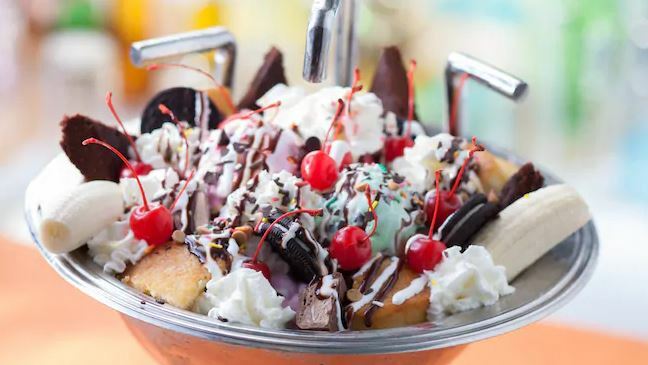 Go for the classic banana split complete with Ghirardelli chocolate ice cream and hot fudge draped over top or feed a family of four with the intimidatingly named Earthquake, a towering confection featuring eight scoops of ice cream, eight toppings, and a healthy helping of chocolate chips, cherries, and whipped cream. Beaches & Cream stands apart from the crowd of ice cream shops in Orlando and in the Magic Kingdom area for two reasons. First, it successfully captures the atmosphere of a classic 1950s soda shop, making dining here like eating in a time capsule. If the charm of its unique aesthetic doesn’t win you over, perhaps Beaches & Cream’s impressive dessert menu will. It’s all good, but the star of the show is undoubtedly the famous Kitchen Sink, a gargantuan dessert stuffed full of ice cream, entire candy bars, whole brownies, and a full can of whipped cream. Clearly designed for large parties, this frozen treat is as much a spectacle as it is a delicious dessert. Most of the shops on this list so far stood out for their bombastic takes on ice cream, but sometimes you just want a classic waffle cone or milkshake. Enter Ginther’s Swirls Ice Cream, a charming little walk-up shop offering traditional soft serve and scoop ice cream in mainstay flavors like chocolate, vanilla, strawberry, and rocky road. Milkshakes, malts, twirls, sundaes, and slushies make up the rest of Ginther’s classic menu. Friendly’s might be a chain along the United States’ east coast, but its menu of signature sundaes, ice cream cones, and strangely named Friend-Z® and Fribble® milkshakes are anything but unoriginal. Mouth-watering sundaes like the Hunka Chunka PB Fudge and Ultimate Cookies ‘N Cream have kept ice cream lovers coming back to Friendly’s for years. 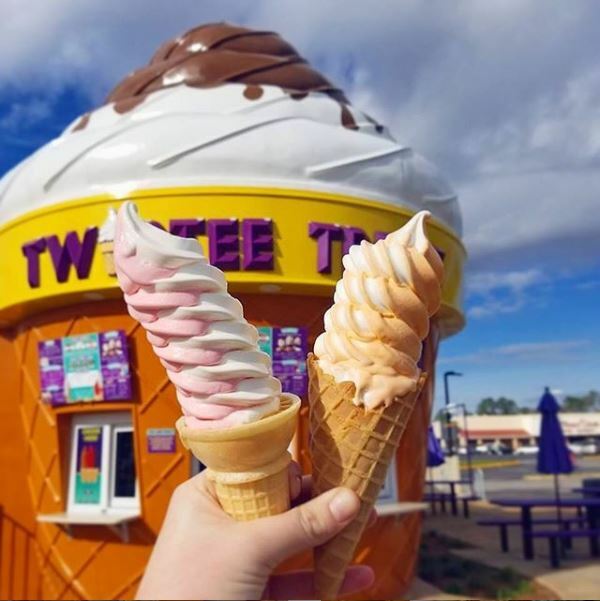 Even if you’re not immediately familiar with Twistee Treat, chances are you’ve seen its 25’ tall ice cream cone-shaped buildings dotting various streets in Orlando. Make no mistake, though: Twistee Treat is more than just a roadside attraction. As the owners of the popular ice cream destination like to say, it’s what’s inside the cone that counts. And on that front, Twistee Treat delivers. Favorites like the Waffle Taco and Cookiewich stand alongside classics like ice cream cones and sundaes to create a menu that’s both unique and traditional. Kelly’s Homemade Ice Cream prides itself on offering delicious ice cream that’s handcrafted right there in the store. No matter which location you visit, you’ll have access to Kelly’s homemade signature flavors. These include Cookie Monster, blue velvet ice cream with Oreos, and Blondie, vanilla ice cream with Golden Oreos, Heath Bar, and white chocolate chips.